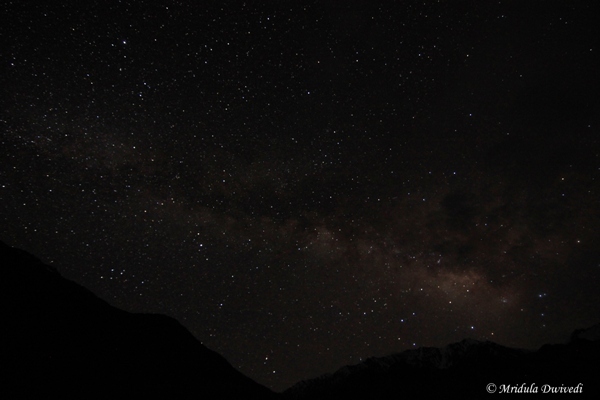 I was star struck, no literally, this time at Batal in Spiti region of Himachal Pradesh. You might have noticed that I vanished for a week, the plan was to visit Chandratal, the stunningly beautiful lake close to Batal. I managed to reach the lake this time though the blue skies eluded me. However, at Batal, for a brief period the weather gods were kind to me. They lit the sky with a million stars! I was so thrilled that I did not leave my tripod behind! This is what I could capture and I have to say for novice at night photography, I am happy with it. Also it was not so cold that I would freeze to death when I stayed out. I do not enjoy freezing to death on cold nights at all. A good down jacket and I was fine outdoors. In fact, I actually enjoyed staying out and turned in only when clouds covered the sky. 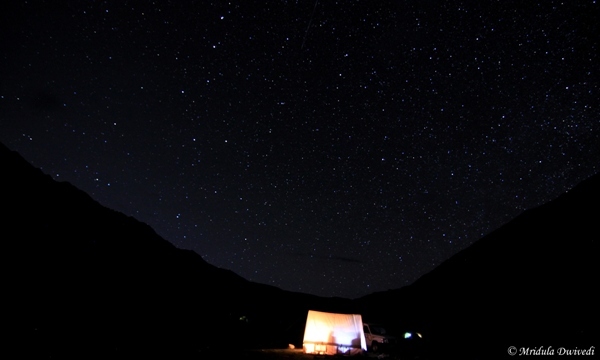 No accommodation can beat staying in a tent under a starry sky, at least for me. There would have been a moon rise at some point but then the clouds obscured it! Though, I am not complaining at all. We went in a jeep up to Batal. There is actually a jeep route all the way to Chandratal but on the day we were going the road was closed. I am probably happier that we walked about 14 km in the stunningly beautiful region. The very next day while coming back, the jeep could come in 9 km ahead as they were repairing the road. I am really happy that I managed to sneak out to the mountains in the end. It always leaves me a much happier person. So, tomorrow while driving if I demonstrate more patience you know why! I trekked with Rama Kant Sharma who is a responsible trekking guide and family friend as well. I will leave you today with the pictures but of course the tales will follow.